The three-bedroom, three-bathroom Anglesea is a popular two-storey house design thanks to its economical use of space. All three bedrooms are large enough to fit a queen or even king-size bed. Two of the bedrooms have their own ensuite and WIR. As an architectural statement Anchor Homes’ iconic split-skillion facade has been used. The two-storey Anglesea design is ideal in a coastal or urban setting. The first floor sits above the right-hand side of the ground floor, and includes its own living area complete with a deck to admire the surrounding views. The lower level features two bedrooms, a large living zone, and an optional decking and double garage. 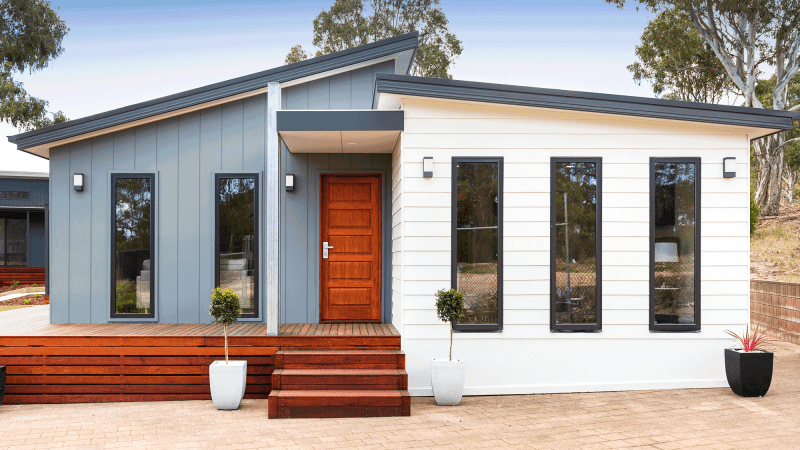 The Anglesea modular home design is the only one in our range that includes three bedrooms and three bathrooms. This unique feature makes it the perfect choice as a holiday home to accommodate multiple families or up to three couples.